On March 14, 1955, students who started their training in the Spring of 1953 received black bands for their caps. This meant they were Seniors. 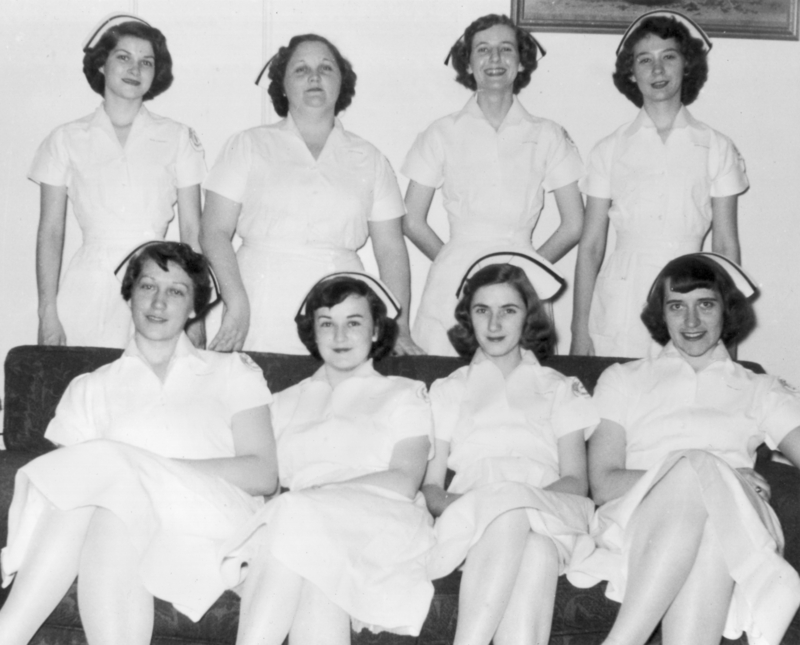 Graduating nurses traditionally handed down their black bands to a student in one of the lower classes. Older nurses chose the younger student they believed was the "best." The new Senior student nurses had the traditional black band banquet, which they cooked by themselves in the kitchen of the nurses' home. Lynn Rule Newman recalls, "The cooks in the hospital kitchen fixed some rolls for our dinner. We fixed everything else." First row, L-R: Norma Jean Walden, Pauline McCoy, Earnestine Sparks, Lynn Rule Second row, L-R: Clara Nell Duckett, Willodean Vaden, GenaV Rollins, Joyce Moore Click on the image for a larger version.